Unless you arrive by cruise ship or your own boat, there's only one way to get to Hawaii - by air on one of the airlines with flights to Hawaii. Fortunately, there are many airlines that fly to Hawaii, not only from the United States and Canada but from multiple foreign cities, principally in Asia and Australia/New Zealand. Here is a breakdown on the airlines that fly to Hawaii, including those that provide inter-island flights. Air Canada, Canada's largest full-service airline and the largest provider of scheduled passenger services in the Canadian market, flies to and from numerous Canadian cities to and from Honolulu (Oahu), Kahului (Maui) and Kona (Big Island). Air Pacific, Fiji’s national airline, flies to and from Honolulu from Apia (Samoa), Christmas Island, Nadi (Fiji) with connecting flights to and from Hong Kong, eastern Australia, New Zealand and numerous South Pacific islands. Alaska Airlines began service to Hawaii in 2009 with flights to and from Anchorage, Alaska and Seattle/Tacoma, Washington to and from Lihue (Kauai), Honolulu (Oahu), Kahului (Maui) and Kona (Big Island). Allegiant Airlines will begin service to Hawaii from several cities in the western part of the United States beginning in 2012. Initial service will begin in June from Las Vegas and Fresno to Honolulu with additional departure cities being added in November 2012, including a direct flight from Bellingham, Washington to Kahului, Maui. 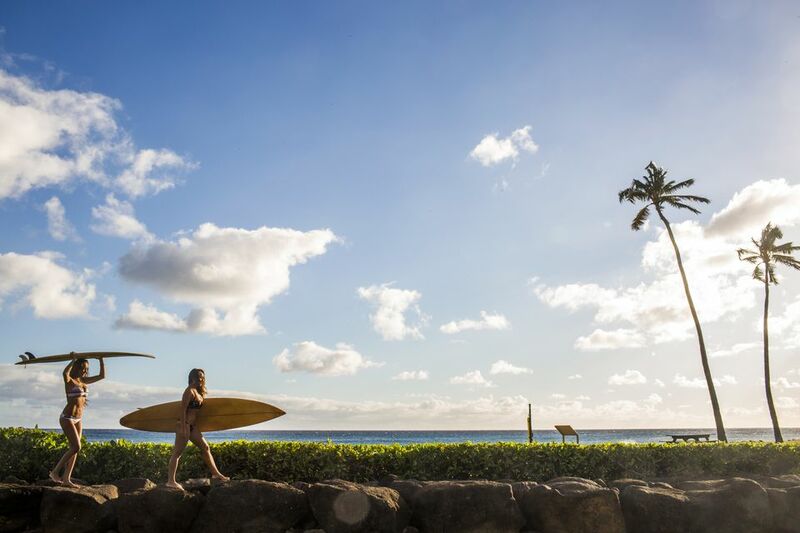 Read more about Allegiant Air's Hawaii flights. American Airlines, one of the largest USA based carriers that serves 250 cities in 40 countries, offers daily flights from many cities worldwide to Lihue (Kauai), Honolulu (Oahu), Kahului (Maui) and Hilo (Big Island) and Kona (Big Island). All Nippon Airways (ANA), the smaller of Japan's two international carriers, but a member of the Star Alliance network, offers daily service from Tokyo(Narita) to Honolulu (Oahu). China Airlines, the flag carrier of the Republic of China (commonly known as Taiwan), offers daily service between Taiwan Taoyuan International Airport (Taiwan) and Narita International Airport (Tokyo, Japan) to Honolulu (Oahu) with connecting service to numerous other destinations in Asia. Continental Airlines offers daily service from Houston, Los Angeles and Newark (NJ) to Honolulu (Oahu). Future service is planned to Kahului (Maui) from both Los Angeles and Orange County (CA) and to Honolulu (Oahu) from Orange County (CA). Delta Airlines (now merged with Northwest Airlines) offers daily service to Honolulu (Oahu), Kahului (Maui) and Kona (Big Island) from numerous US cities as well as a number of international locations, primarily in the Far East. Island Air, Hawaii's second oldest airline, celebrating their 30th anniversary in 2010 is a regional carrier, serving airports on all major Hawaiian islands. The airline offers flights between the Honolulu International Airport, Kahului (Maui), Kapalua (West Maui), Ho‘olehua Airport (Moloka‘i), Lana‘i City Airport (Lana'i), Lihue (Kauai), and Kona (Big Island of Hawaii). Island Air operates a fleet of 37-seat Dash 8 turboprop aircraft. Go! based in Honolulu is a regional brand of Phoenix, Arizona-based Mesa Airlines. Go! operates inter-island services within Hawaii. Go! serves Kona, Lihu'e, Hilo, and Kahului from their hub at Honolulu International Airport. They also offer go!Express services, operated by Island Air, to the smaller cities of Ho'olehua, Moloka'i, Lana'i City and Kapalua, (West) Maui. Hawaiian Airlines, founded in 1929 (as Inter-Island Airways), is the 11th largest commercial airline in the United States and the largest airline based in the State of Hawaii. Hawaiian Airlines flies both inter-island routes and direct flights from numerous USA mainland cities in Arizona, California, Nevada, Oregon, and Washington. They also offer international flights from Pago Pago, American Samoa; Manila, Philippines; Papeete, Tahiti; and Sydney, Australia. Japan Airlines, the largest international carrier in Japan, offers daily flights from Narita International Airport (Tokyo), Chubu Centrair International Airport and Kansai International Airport (Osaka) to Honolulu (Oahu) and from Narita International Airport (Tokyo) to Kona (Big Island). Jetstar Airways, Australia, and Singapore's new (2004) low-cost airline offers several weekly flights between Sydney, Australia, and Honolulu (Oahu). Jetstar's Australian operation is wholly owned by Qantas but is managed separately and operates independently. Korean Air, South Korea’s flagship airline offers daily flights between Seoul Incheon International Airport and Honolulu (Oahu). A U.S. Part 121 charter air carrier who partners with major tour operators, cruise lines, sports/incentive charters, commercial airlines and the U.S. Department of Defense. Philippine Airlines, the national airline of the Philippines, offers three roundtrip flights each week between Ninoy Aquino International Airport (Manila) and Honolulu (Oahu). Qantas Airways, the national airline of Australia and Australia's largest airline. It is also the world's second oldest airline. Quantas offers three weekly roundtrip flights between Sydney, Australia, and Honolulu (Oahu). United Airlines one of the world's largest airlines and a founding member of the Star Alliance offers numerous flights each day between major US cities and Lihue (Kauai), Honolulu (Oahu), Kahului (Maui) and Kona (Big Island). United brings more passengers to Hawaii than any other airline. They offer direct flights to Hawaii from their hubs in Chicago (O'Hare), Denver, Los Angeles, and San Francisco. US Airways (including the former America West) offers direct flights between their Phoenix hub and Lihue (Kauai), Honolulu (Oahu), Kahului (Maui) and Kona (Big Island) as well as between their Charlotte, NC hub and Honolulu (Oahu). As a member of the Star Alliance, connections are available from most major US and foreign cities. Westjet Airlines, a Canadian low-cost carrier based in Calgary, Alberta, that offers a number of flights each week between Vancouver and Lihue (Kauai); Victoria, Vancouver, Calgary and Honolulu (Oahu); Vancouver, Calgary, Edmonton and Kahului (Maui); and Vancouver and Kona (Big Island of Hawaii). Check prices for your flight to Hawaii on TripAdvisor.